A champion’s motivation comes in many forms. 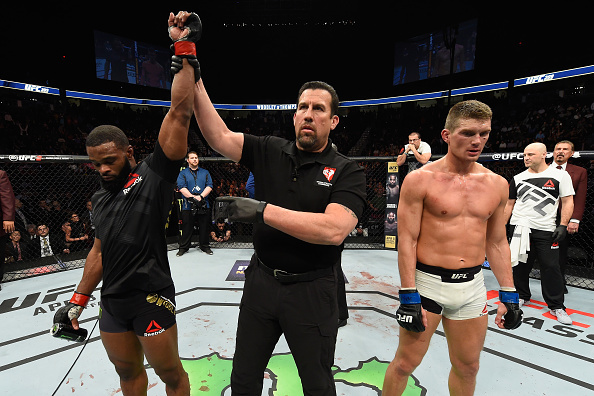 For Tyron Woodley, who defends his UFC welterweight crown against Demian Maia in the co-main event of UFC 214 this Saturday, it’s not about the money, the glory or the fame, though all those things are nice. But if Woodley puts on his analyst’s hat, it’s clear that throughout his life, being the best has always been what drove him the most, even going back to his days on the wrestling mat. To illustrate the point, he talks about strength and conditioning guru CT Fletcher. Woodley won his share, becoming one of the best wrestlers in the country, but it was in MMA that he became one of the best fighters in the world. There is no disputing that, not after a 12-month period that has seen him take the 170-pound title from Robbie Lawler and successfully defend it twice against Stephen Thompson. Saturday will mark his fourth fight in a year, but there is no rest for the 35-year-old, not with even more big fights on the horizon. “I’ve been on a roll, I’ve been blessed, and I’ve been working – not just in fighting but outside of fighting, said Woodley, who still hasn’t had the time to sit back and take everything in yet. But as far as the rest, it just hasn’t been the victory lap many titleholders have. When he beat Lawler, it was a devastating knockout and a bittersweet one, as he and Lawler are friends and were American Top Team squadmates at the time. Then it was a pair of fights with Thompson, the first resulting in a Fight of the Night draw, the second a close decision victory. Now it’s off to Maia, the type of fighter that can end someone’s night in a hurry if he catches them with his deadly submission game. Then it’s off to the next one, kind of like those old wrestling tournaments, with the scary part for the rest of the division being that Woodley believes that after Saturday night, things might just be getting easier. So if the up and comers have a target on his back, bring it on. But will he now get to enjoy being the champ? “I think after this fight I might start,” he laughs.